Back in the 90s during the EXTREME Liefeldian comic book trend of guns, muscles, pouches and seemingly interchangeable character models, Image Comics emerged and marketed itself as a viable third party comics opportunity for those wanting a change of pace from DC and Marvel's tired gimmicks, rote storylines, and shameless exploitation of decades old characters. Unfortunately, Image often differentiated itself by simply ripping off existing DC and Marvel properties. Spawn was unique to this new crop of heroes. Instead of emulating a single character, he attained the powers of every single superhero. It comes as no surprise that such an unimaginative model would create an equally lackluster film. 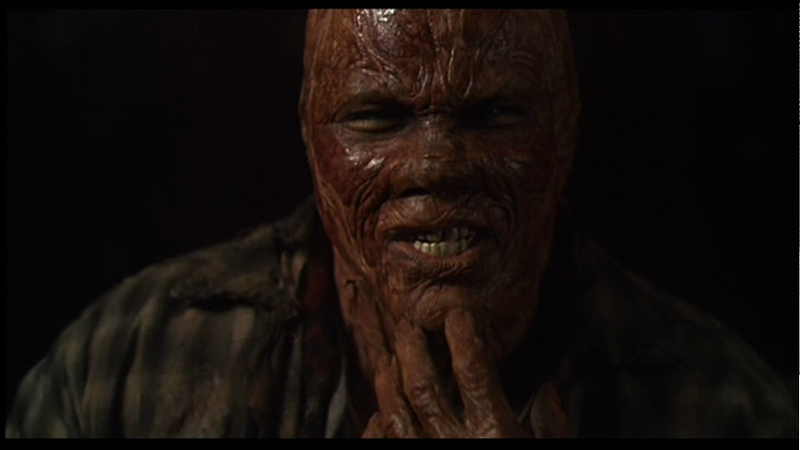 General audiences didn't gravitate toward another superhero origin story with awful Doom 2 special effects. "My Spidey Sense is tingling! I have that, right?" Al Simmons (Michael Jai White) is a super soldier sent to exotic locations to engage in top secret spy missions. He excels at his job, due mostly to his innate ability to kick and shoot people without considering the consequences. In the opening scene, Simmons murders everyone inside an air traffic control tower at the Hong Kong Airport. After using high-tech infrared computer-targeting night vision goggles, he spots his subject and lets loose a rocket to take him out. 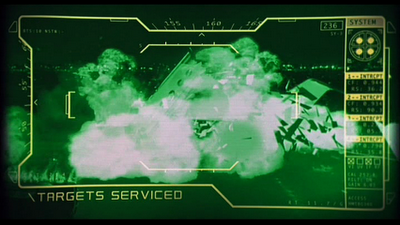 Of course, since it's a rocket, it also blows up everyone that isn't his target. And aside from a high vantage point, a control tower serves no significant tactical advantage, at least enough of one to justify murdering a dozen people. Target destroyed. Everything within a half a mile of the target also destroyed. When Simmons refuses to go through with a mission that kills slightly more innocent people than he's comfortable with, his boss Jason Wynn (Martin Sheen, bearing a striking resemblance to Charlie Sheen today) shoots him, exposes him to an experimental gas, and sets him on fire. Like all deaths-by-immolation, this sends Simmons straight to hell, where he does some things he doesn't remember, and he's spit back up into the real world to wander around groaning and holding his head in his hands like the Phantom of the Opera lamenting the monster he's become. "Why did I insult that gypsy's beef jerky recipe? WHY?" 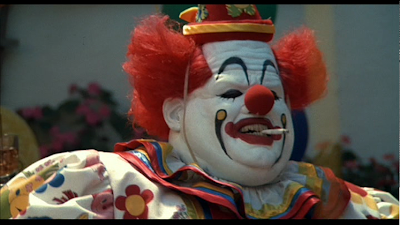 Five years later, Simmons gets his act together enough to crash his daughter's birthday party, where they've hired the SCARIEST CLOWN EVER (John Leguizamo), presumably because the kindergartener is a big fan of Violent J. Did he have an ad in the yellow pages? 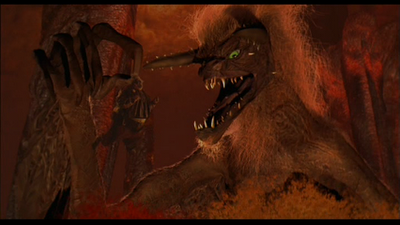 The disgusting wisecracking clown takes Simmons under his wing and explains through sloppy narrative structure that he's dead, went to hell, and now he has to lead a demon army. Simmons reacts with more groaning and head-holding, and the clown spouts off catchphrases, fart jokes, and lines from better movies. Fart jokes = Funny. Atomic fart jokes = Hilarious. 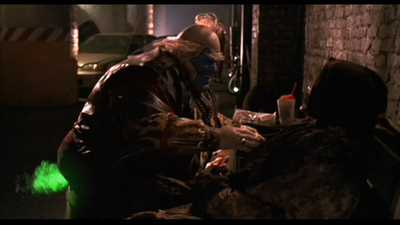 Eventually Spawn settles into a by-the-numbers origin story akin to Highlander/The Empire Strikes Back/Pretty Much Everything: Simmons befriends kindly old man Cogliostro (Nicol Williamson) who somehow knows everything about Spawn's powers and how to control them. At first Spawn is not very good but slowly over time he gets better, until unlocking all abilities and achieving level 60. Crashing parties the Batman way! Tack on Ghost Rider's origin story and a clown as a primary villain, Spawn has basically ripped off every single superhero in some way, shape, or form. The only thing missing is time travel, talking to fish, and shooting fireworks out of your hands (though he could probably do any of these if he wanted to). 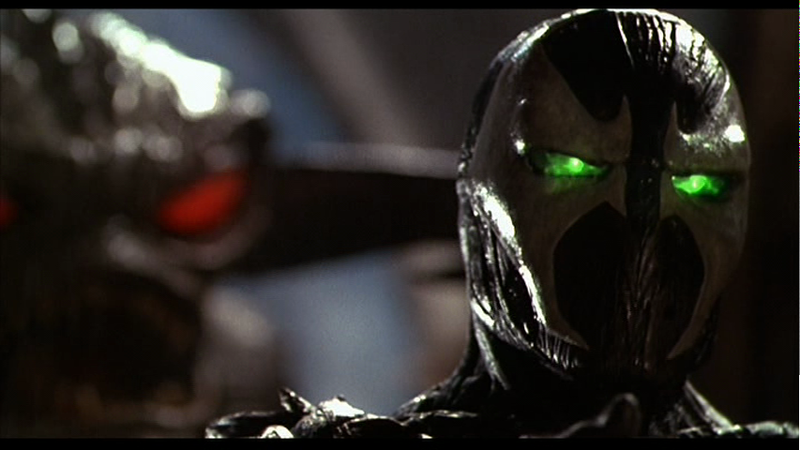 In the canon of superhero movies, Spawn is a mediocre entry in a massive collection featuring a lot better and a lot worse. Many single out Leguizamo's performance as refreshing in an otherwise dull outing. Leguizamo does, in fact, say his lines very enthusiastically, but unfortunately the screenwriter gave him awful things to say. Most of his lines are variations of dialogue from other movies, as if to validate Spawn's overwhelmingly derivative vision. When the only bright spot is an obese demonic clown with radioactive farts, there's something inherently flawed in your film. 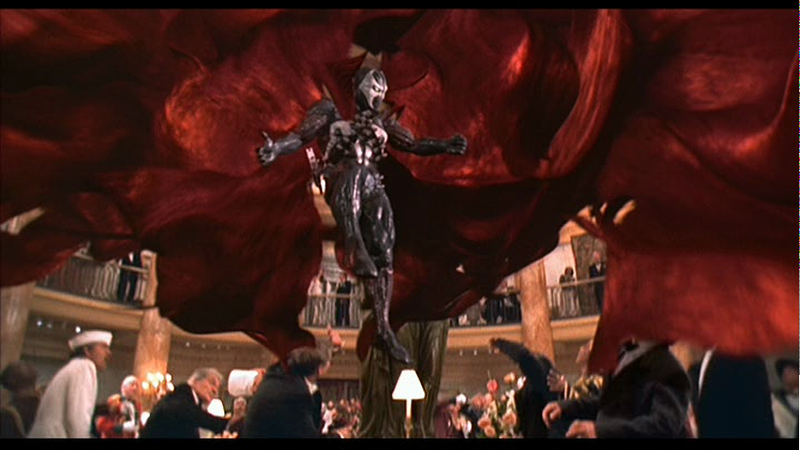 For some reason Roger Ebert gave Spawn 3 1/2 stars, saying it's best to look at as an "experimental art film" rather than an action movie. Kind of like how I view Roger Ebert as a lazy populist hack than an actual film critic. Unfortunately the CGI couldn't fully render in time for the premiere. The CGI is worth noting in that it's especially awful; Malebolgia (the devil) is rendered like a mid 90s arcade cut scene. The only people who should be proud of their work are the costumers and make-up artists, who create incredibly vivid and memorable pieces in a film that is mostly routine. Aside from this one bright spot, Spawn is another bit of late 90s nostalgia which should be placed in the time capsule next to the Hanson album, Pog collection, and autographed photo of Will Fridle. 3 out of 47 Limited Edition Variable Comic Covers. Spawn: You sent me to Hell, Jason! I'm here to return the favor! Clown: You're dead. D-E-D dead! Clown: Oops. A wet one. I hope I didn't stain my underwear. Look at that, skid marks! The most amazing powers are usually given to the most unimaginative characters. "Kind of like how I view Roger Ebert as a lazy populist hack than an actual film critic." I admit that sentence is pretty catty. Spawn was the first movie I ever walked out of. Or I would have walked out of it if I weren't 10 years old and incapable of driving myself home. If I had any sense, I would have just walked into another theater, but instead I just hid behind a seat in the very back and waited for the movie to end. My brother and I were the only ones in the theater at the time. To this day, I still remember that "I hope I didn't stain my underwear!" line with crystalline clarity. I'm pretty sure the farting clown is what made me to decide it was time to hide from the horrible movie.